Ghiotto blazes through the desert, ahead of Louis Delétraz and Nyck de Vries. The first qualifying session of the year took place on the Sakhir International Circuit this afternoon. Louis Delétraz and Sergio Sette Câmara were both strong in the early stages of the session. Sette Câmara clocked in a 1:41.506, which beat the pole position time set by Lando Norris last year of 1:41.761. In the 12th minute, Callum Ilott lost control of his car and ran into the barrier, causing a red flag. Ilott remained unharmed, however the Brit uttered “I’m such an idiot” to his Sauber Junior team over the radio. A disgruntled and frustrated Ilott got out of his car, while Nicholas Latifi had set the fastest time of 1:41.389 before the session’s halt. The session restarted at 17:09 local time with 18 minutes left on the clock. Sette Câmara was first out, but he had to abandon his lap after running wide through the dust. Latifi continued to breeze past the rest to set the standard to the 1.40s, with Jack Aitken completing a flying lap to move him up to P2. It all began to heat up in the final stages of qualifying. Nyck De Vries, Delétraz and Ghiotto were shooting it out for fastest lap. De Vries went top momentarily only to be edged out by Delétraz. However, it was ultimately Ghiotto who came back to clock in a quick 1:40.504 in the final 2 minutes. This was almost four tenths away from Delétraz who secured P2. This was enough to secure Ghiotto pole position and give UNI-Virtuosi their first points of the season. Rounding off the top ten is Nicholas Latifi in P4, followed by Jack Aitken, Nobuharu Matsushita, Sean Gelael, Sette Câmara, Ralph Boschung and Mick Schumacher. The top 10 were all within a second of pole. 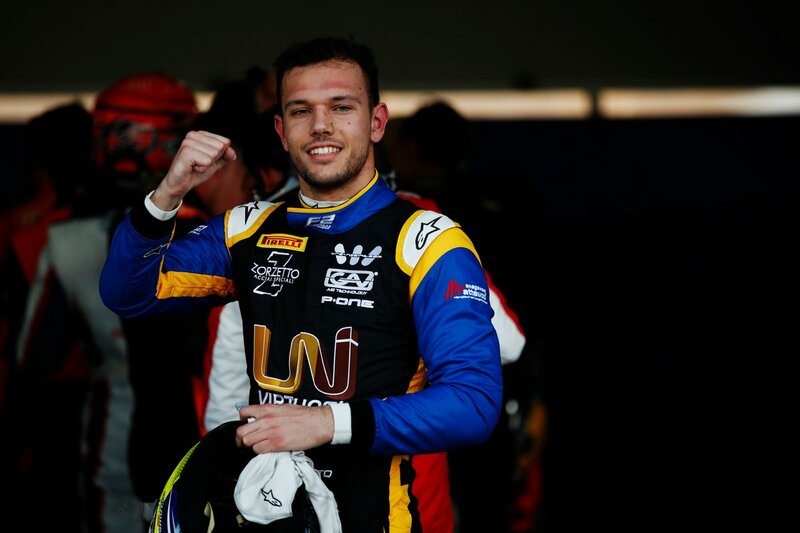 And completing the grid is Anthoine Hubert, Juan Manuel Correa, Nikita Mazepin, Jordan King, Giuliano Alesi, Dorian Boccolacci, Guanyu Zhou, Callum Ilott, Tatiana Calderón and Mahaveer Raghunathan.